Imagine having a vegetable garden that takes care of itself. Now wouldn’t that be great? Owning a garden that requires little time and effort from you. Well…at quick-and-easy-vegetable-garden.com we believe it’s the way to go. Be forced to change your schedule to suit the garden you’ve planted. You can design one that fits into your lifestyle. Now, doesn’t number 2 sound better? At our site we’re providing instructions, information and, inspiration for achieving No.2. We have some excellent easy tips on how to grow vegetables yourself even if you’re a newbie. Everything from eliminating garden pests to types of vegetables, organic gardening, container gardening,planting herbs and a whole lot more! You can still fulfill your garden dream. We’re providing solutions to these problems so there is no need to worry. Take a look at some creative and innovative ways to grow vegetables. Have you ever thought about the idea of taking a vacation for a while and returning to your garden that is still in good condition or even better? This site is offering you ideas on how to implement garden systems that will take care of your garden even when you are not around. For example, drip irrigation systems and mulch along with others. ……you don’t have to drive to the grocery to buy vegetables, you grow your own! That means less exposure of fossil fuels in the air and this is an excellent boost for the environment. Save money on food and live a healthy lifestyle, both mentally and physically. Gardening is a form of therapy where it eases your mind and helps you keep fit at the same time. It’s definitely worth considering as it can also add great value to your property. After all, inspiration can really give you that go garden attitude. …..Over 41 million U.S. households grew a vegetable garden in 2009? That’s 38%. That’s pretty huge and also those who were new to vegetable gardening made up 7.7 million households (that’s 7%) of the 41 million. Even President Obama and his family are getting in on the act. And guess what… they’re newbies just like most of us. Producing vegetables is becoming more and more appealing to both new and experienced gardeners. But don’t be fooled. Like everything else in life, an ideal vegetable garden requires some work. Will provide you with modern day techniques and systems to make vegetable gardening not only a quick and easy task but interesting as well. Thank you for visiting our site and feel free to go ahead explore and enjoy! The Vegetable Garden Blog keeps you up-to-date with all additions and changes to the Quick-and-Easy-Vegetable-Garden.com Web site. Subscribe here. Growing vegetable garden seeds from scratch or seed starting is a great pastime and activity. At quick and easy vegetable garden you’ll find all the info you need for growing organic seeds and plants. Planting herbs was a benefit to my vegetable garden. I also use the herbs in teas, fresh salad and culinary dishes. They’re good for my health and skin. A raised bed vegetable garden is so easy to set up and establish. Here are some free and cool ways for gardening raised beds along with some raised bed vegetable gardening tips. If it weren’t for timesavers I never would have started my vegetable garden. The thought of digging and pulling out weeds were the greatest turn offs. But I was able to get around these tasks. Using your vegetable garden planting skills puts money back into your pocket. Growing a vegetable garden reduces your food bill. But growing vegetables quick and easy is an added bonus. You can save.. Delicious and easy vegetable recipes to try out after collecting your harvest from your vegetable garden. These are made up of some vegetable soup diet recipes along with some easy veggie dishes. Your feedback is very important to us. Feel free to add your comments to our site right here. You can provide some feedback or any vegetable garden tips by filling out the form. 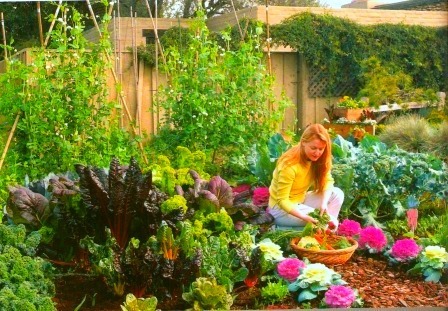 Vegetable garden sitesearch can offer you a lot of info on quick and easy vegetable gardening. Would you like to share your knowledge about vegetable garden? Great, find out how you can submit your story or tip here.